පැස්බරා සැඟවීම පිණිස වැල්ලේ දිව ගොස් සිය හිස පමණක් සඟවා ගන්නේ සිය පශ්චාත්බාගය සැමට පෙනෙන පරිදි එක එලියේ දමාගෙනය. දේශපාලනීයකරණය වූ ශ්‍රී ලංකාවේ පොලිස් ලොක්කන් සහ පොලීසිකරණය වූ දේශපාලන ලොක්කන් දෙපිරිසම වල් වැදුණු නීතියේ පාලනය නැමැති ආණ්ඩුවේ පශ්චාත්බාගය කාටත් පෙනෙන සේ දැන් හැසිරෙන්නේ එක එලියේ දමා ගත් පැස්බරුන් ලෙස ය. දෙසතියක් ගත වී ඇතත් විශේෂ පොලිස් විමර්ශන කණ්ඩායමක් පත් කරන ලද බව වාර්තා වූවත් සියත මාධ්‍ය ආයතනයට එල්ල වූ ප්‍රහාරය පිළිබඳ පොලිස් පරීක්ෂනය අවසන් නැත. එබැවින් පොලීසියට කිසිදු නිගමනයනට පැමිණීමට ද නොහැකිය. ඒ වනාහී සරළවම කරුණූ පවතින හැටි ය. “පොලීසිය විශ්වාස කරන්නේ සියත මාධ්‍ය ජාලයට මෑත දී කරන ලද ප්‍රහාරය කොන්ත්‍රාත් කල්ලියක් විසින් කරන්නට ඇති බවයි. මෙම කොන්ත්‍රාත්තුව දෙන ලද්දේ තරඟකාරී (ආයතනයක) පුද්ගලයකු විසින් ද එසේත් නැත්නම් මෙම ආයතනය විසින් විකාශණය කරන ලද පුවතක් හෝ වැඩසටහනක් නිසා කේන්ති ගිය පුද්ගලයකු විසින් ද යන්න පැහැදිලි නැත. මෙම ප්‍රහාරය දේශපාලන පිටු බලය ඇති සන්නද්ධ කල්ලියක් විසින් නොව පතාල සන්නද්ධ කල්ලියක් විසින් කළ බවට නිගමනය කිරීමට පරීක්ෂණය අවසන් වීමට පෙරම පොලීසියට ඇති සාක්ෂි මොනවාද? 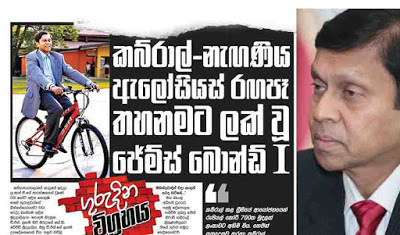 කොන්ත්‍රාත් කල්ලියක් බව කීම මගින් පොලිස් ප්‍රධානියා උත්සාහ කරන්නේ දේශපාලන පිටුබලය ලබන කල්ලි මෙම ප්‍රහාරයෙන් නිදහස් කිරීමට නොවේ ද? 12 දෙනෙකුගෙන් යුත් කොන්ත්‍රාත් කල්ලියකට ආයුධ රැගෙන කොළඹ නගරයේ අධි ආරක්ෂිත කලාපයක නිදහසේ ගැවසෙමින් මෙවැනි අපරාධයක් කර බේරී පලා යාමට හැකි යැයි අප විශ්වාස කළ යුතුයැයි පොලිස් ප්‍රධානියා විශ්වාස කරන්නේ ද? දෙවනුව තරඟකාරී මාධ්‍ය ආයතනයක් මෙම ප්‍රහාරය පිටුපස නොසිටින බව ප්‍රකාශ කිරීමට, සියත මාධ්‍ය ආයතනය නව මාධ්‍ය ආයතනයක් බව කීම පමණක් ප්‍රමාණමත් හේතුවක් ද? සියත හිමිකරුවන් කියා සිටියේ අලුතින් පටන් ගන්නට යන රූපවාහිනී මාධ්‍ය ආයතනයක් මෙම ප්‍රහාරයට සම්බන්ධ දැයි තමන්ට සැකයක් ඇති බව ය. එම සැකය එල්ල වී තිබුණේ මෑත දී රූපවාහිනී බලපත්‍ර ලද පාලක පක්ෂයේ වන්ඩි දේශපාලනඥයකු සම්බන්ධ ගුවන් විදුලි ආයතනයකට ය. පොලිස් ප්‍රධානියාගේ මෙම ප්‍රකාශයේ අරමුණ එම දේශපාලඥයා සියත ප්‍රහාරයෙන් බේරා හැරීම ද? පොලිස් ප්‍රධානියා එම පුවත්පතට කියා ඇති පරිදි මෙම ගිනි තැබීමට හේතුව සියත මාධ්‍ය ආයතනය විසින් විකාශනය කළ පුවතක් හෝ වැඩසටහනක් විය හැකි යැයි කියා ය. එසේ කීමට ඇති හේතු මොනවා ද? පොලීසිය සියත පුවත් විශලේශණයක් කර එවැනි පුවත් ඇත්දැයි විමර්ශනය කළේ ද? පොලිස් ප්‍රධානියා කියා සිටින පරිදි තමන් පිළිබඳ වැරදි පුවතක් පළ කිරීම නිසා මාධ්‍ය ආයතනයන්ට මෙවැනි ප්‍රහාර සාමන්‍ය පුරවැසියන් විසින් කරන ලද අවස්ථා මීට පෙර තිබී ඇත් ද? එසේ නැත්නම් පොලිස් ප්‍රධානියා කියන්නේ මෙයට පෙර එවැනි හේතු මත ජනමාධ්‍යට තර්ජනය කළ පුද්ගලයින් මෙම ප්‍රහාරය පිටුපස ද සිටිය හැකි බව ද? අප දන්නා තරමට නම් එවැනි තර්ජන එල්ල වූයේ ආණ්ඩුවේ ප්‍රධානීන්ගෙන් පමණ ය. ඩේලි මිරර් කතුවරිය තමන්ට ආරක්ෂ ලේකම් රාජපක්ෂ මහතාගෙන් තර්ජනාත්මක ඇමතුමක් ලැබුණු බව වාර්තා කරන ලද අතර ද සන්ඩේ ලීඩර් කර්තෘ ලසන්ත වික්‍රමතුංග තමාට ජනාධිපති රාජපක්ෂගෙන් තර්ජනාත්මක ඇමතුමක් ලද බව කියා සිටියා ය. ඒ කළකට පෙර යුද්ධය පැවැති කාලයේ දී ය. ද නේෂන් පුවත්පතෙහි සහකාර කර්තෘ වශයෙන් සේවය කළ කීත් නොයර් පැහැර ගෙන ගොස් පහර දෙන ලද්දේ යුද හමුදා මෙහෙයුම් විවේචනය කළ නිසා යැයි විශ්වාසයක් තිබේ. නමුත් පොලිස් ප්‍රධානියා එවැනි කිසිවකු සම්බන්ධයෙන් සැකයකට ඉඩක් තබන්නේ නැත. මන්ද යත් එවැනි පුද්ගලයින්ට කොන්ත්‍රාත් කල්ලි අවශ්‍ය නැති නිසා ය. ඔවුන්ට රාජ්‍ය සන්නද්ධ හමුදා තිබේ. එබැවින් පොලීසියේ මෙම ප්‍රකාශයෙන් කියැවෙන්නේ කවර හෝ වෙනත් පුද්ගලයකු විසින් කොන්ත්‍රාත් කල්ලියක් යොදවා මෙම ප්‍රහාරය කර ඇති බව යි. පොලීසිය මෙහිලා ඇත්ත ඇත්ත වශයෙන්ම උත්සාහ ගන්නේ මෙම ප්‍රහාරය සිදුකළ අපරාධකරුවන් හෙළිදරව් කිරීමකට වඩා ඒ සම්බන්දයෙන් සැක කැරෙන පිරිස් බේරා හැරීමට බව පෙනේ. කෙසේ වෙතත් එක් දෙයක් පැහැදිලි ය. එනම් පරීක්ෂන අවසන් වීමට පෙරම පොලිස් ප්‍රධානීන් පරීක්ෂන නොමග යැවෙන කතා කීමට පටන් ගෙන ඇති බව ය. සියත මාධ්‍ය ජාලය ප්‍රථමයෙන්ම ආරම්භ කළ සියත පුවත්පතෙහි එහි ආරම්භක කර්තෘ සහ ප්‍රවෘත්ති කර්තෘ වූ මංජුල වෙඩිවර්ධන සහ අතුල විතානගේ ඉන් ඉල්ලා අස්වූයේ එහි මුල් පිට සකස් කැරුනේ ජනාධිපති කාර්යාලයට අවශ්‍ය පරිදි වෙනස් කරන බවට සාක්ෂි සහිතව පෙන්වා කර්තෘ නිදහස කෙළෙසීමට විරෝධය පළ කිරිමක් ලෙස ය. සියත මාධ්‍ය ජාලය ඒ තරමට ම රාජපක්ෂ ආණ්ඩුවේ ව්‍යාපෘතියේ කොටස්කරුවකු විය. නමුත් ජනාධිපතිවරණ සමයේ එහි හිමිකරුවනට හදිසියේ ම කැනඩාවට පලා යාමට සිදු වු අතර පසුව ආණ්ඩුවේ වෙළද දැන්වීම් නැතිව ගොස් මෙයට දෙමසකට පෙර පුවත්පත වසා දැමීමට සිදුවිය. රොයිටර් පුවත් සේවය වාර්තා කළේ ජනාධිපතිවරණ සමයේ දී සියත මාධ්‍ය ජාලය විපක්ෂ අපේක්ෂක ජෙනරල් පොන්සේකාට සහාය දැක්වීම මෙම අර්බූදයට හේතුව බව යි. ආණ්ඩුව සහ සියත හිමිකරුවන් අතර කුමණ හෝ ප්‍රශ්ණයක් තිබූ බව ඉතා පැහැදිලි ය. එබැවින් පොලිස් ප්‍රධානියාගේ ප්‍රකාශයේ අරමුණ වන්නේ මෙම ප්‍රහාරයට ආණ්ඩුව සම්බන්ධ බවට කවර හෝ සැකයක් නැතැයි රටට ප්‍රකාශ කිරීම යි. පොලීස් ලොක්කන් අතේ රෝල් ඇද බා දේශපාලන කාරියක් ඉටු කරන්නේ හිස සඟවා පශ්චාත්බාගය එලියේ දමන පැස්බරුන් ලෙස ය. පසුගිය කාලය පුරා ජනමාධ්‍යට සහ ජනමාධ්‍යවේදීන්ට කරන ලද ප්‍රහාරයන් සම්බන්ධයෙන් ශ්‍රී ලංකාවේ දේශපාලනීයකරණය වූ පොලීසියත් පොලීසිකරණය වූ දේශපාලනඥයිනුත් කියා ඇත්තේ මෙවැනි කතා පමණය. එනම් සැබෑ අපරාධකරුවන් බේරා පරීක්ෂණ නොමඟ යැවෙන කතා ය. 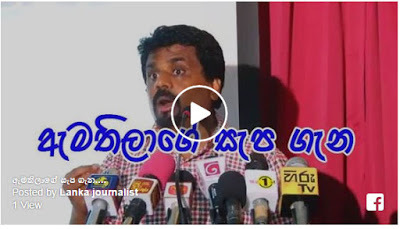 ප්‍රගීත් අතුරුදහන් වූ විට එය කැමැත්තේන් සැඟවී සිටීමක් ලෙස දකවන ලද්දේ ඔවුන් විසිනි. දෙසතියක් ඇතුළත ප්‍රගීත් පිළිබඳ තොරතුරු ලබා දෙන බවට ඇමැතිවරු කී දෙනෙක් අපහාසයෙන් කතා කළෝ ද? සිරස ආයතනය ගිනි තැබීම ගැන කිවේ එය එජාපය ද සම්බන්ධ වී කරන ලද ඇතුලේ වැඩක් කියා ය. ලසන්ත ඝාතනය සම්බන්ධයෙන් කීවේ ද එය පුද්ගලික ආරවුලක් විය හැකිය කියා ය. ලසන්ත ඝාතනයට සම්බන්ධ බවට නීතිපති දෙපාර්තමේන්තුව අධිකරණයයෙහි නම් කළ හමුදා නිලධාරියා දැන් ඇප පිට නිදහස් කර ඇති අතර ඔහුට විරුද්ධව එවැනි චෝදනාවක් නැත. දෙමළ ජාතික පාර්ලිමේන්තු මංත්‍රිවරුන් වූ රවිරාජ් සහ මහේශ්වරන් ඝාතනය කොට ගලා ගිය ලේ මිදෙන්ටත් පෙරම එම ඝාතන එල්ටීටීඊ ලැයිස්තුවට දමන ලද්දේ ද මේ දේශපාලන පොලීසිය විසිනි. I consider it a privilege to speak a few words on the theme, “Lasantha Wikrematunga and contributions he made to journalism in Sri Lanka ” at the announcement of UNESCO press freedom award with which the slain editor was honoured just yesterday. Two motor cyclists followed him while two motor cyclists were waiting at the place he was killed to block his path. All were wearing black. We still do not know how he was killed. The post- mortem report states he died of gun shot injuries. Doctors who examined him as he breathed his last couldn’t find any evidence of external bullet wounds. Nor did the police find any empty cartridges. It was by all means a very very professional job. They came to kill him at any cost. Why did they kill him? What was the contribution he made to Sri Lankan media that his killers wanted stopped? Yesterday and today, we are gathered here to celebrate journalism. 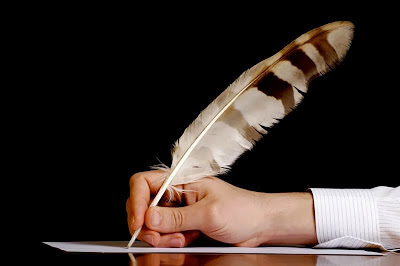 It is a profession which we all know should be about accuracy, balanced and fair story telling. 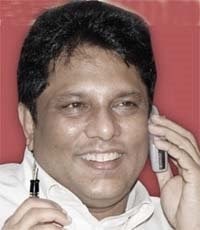 Lasantha Wickrematunge, Editor of The Sunday Leader is remembered today for his professional courage - that is journalism. The killers are in hiding. Not only from society but also from themselves. They will never ever admit that they killed him. Most probably his real killers too may have publicly condemned the killing. Lasantha is not the first journalist to get assassinated in Sri Lanka in recent times. And I am afraid that he may not be the last. But his killing sparked off a fear that no other journalist's death generated. It was like a final warning. Death was the penalty for airing dissenting opinion. Just two days before he was killed, a popular TV and radio station, the MTV/MBC net work was set on fire. Two weeks after the killing of Lasantha, on 22nd January an attempt was made on the editor of the Rivira newspaper, Upali Tennakoon. 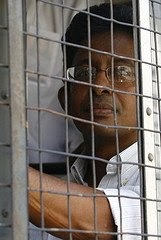 A month later on 24th February, the editor of the SuderOli newspaper, N. Vithiyatharan was abducted and assaulted. The government later announced that he was in their custody. Five weeks later, on 1st of April, the Editor of the Vaara Ureikal M.I. Rahmahetulla was attacked with long knives and his office was destroyed. During the same period a number of editors were summoned to police intelligence units and questioned on war related issues and demanded to reveal their sources. 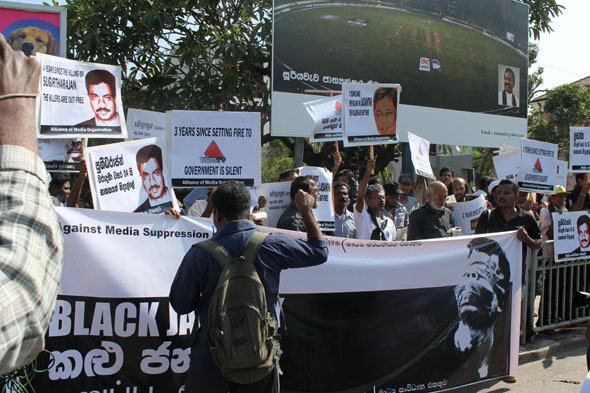 Suppression of media freedom and threats to journalists increased in Sri Lanka during the first three months of 2009. Over the last three and half years 20 journalists and media workers have been killed in Sri Lanka . Other news and alternate points of view became rare. The official government line was repeated again, this time sternly "Criticism and dissent in times of war is treason." It is in this context that we must place Lasantha's contribution to media in Sri Lanka - that is media behavior in times of war. Of course there are many other contributions he made, such as his pioneering efforts in investigative and campaign journalism. His courageous advocacy of a negotiated political settlement to the conflict as opposed to a military option. To understand his contribution better, what we need to do is to look at media in Sri Lanka today, post Lasantha. We all know that Sri Lanka is going through a humanitarian tragedy of untold proportions. The international media covering the Sri Lankan conflict does attempt to have a diverse and inclusive coverage. It is due to their efforts that the world came to know of the suffering of our people in the Vanni in recent weeks. We journalists in Sri Lanka failed in the basics of journalism, we failed to do our duty by the suffering people in Vanni. Most of us who watch BBC, Al Jazeera, CNN have seen the footage of mothers soaked with the blood of their infants, fathers who carry their dead children, and hundreds of Tamil civilians killed in the battle field. Those are powerful images which show the horror of war that could have evoked a public response and even an outcry against the execution of a bloody war that victimizes mostly the non combatant civilians. Tamil civilians were being killed and injured in the hundreds everyday. This is a fact of life that no one can deny. The Sri Lankan media has hit an all time low at present. This is true of the printed word as well as the audio visual media in covering the conflict and offering diverse opinion. Not a single Sri Lankan newspaper or a TV station prints or telecasts the horrifying images of the war zone today, the same we get to watch on international television coverage and in foreign newspapers. A vast majority of Sri Lankans only hear and see war propaganda. For example, on a day that more than a hundred civilians had died in the war zone, one newspaper carried only one news item on civilian deaths: "three children killed by Tiger fire". Of course, the LTTE indiscriminately uses civilians as a human shield and there are credible reports to prove that they are shooting at people who are trying to escape. But those of us journalists who have witnessed this war for decades, know the other side does it too. Government fire also kills. Bullets do not discriminate. And whoever uses more firepower kills more. Do we have a right to report when government fire kills? Do we have a right to investigate and report when charges are leveled against the government on the use of cluster bombs? Do we have the right to report on casualties of both sides? Do we have a right to investigate and report when hundreds of thousands of people are trapped in a war zone without basic human needs? Finally, when we report, as journalists do we have the right not to take a side in this war? If you look at Sri Lanka today the answer is a big NO! Today, Sri Lankan media is practicing an unprecedented level of self -censorship. This war is a war without witness. War propaganda is what is dished as news. This is true for both sides. 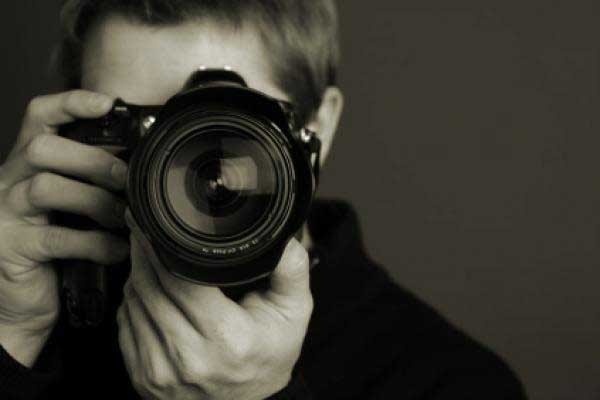 In suppressing media both sides have become mirror images, complementing each other. A culture of silence prevails when it comes to reporting the horror of war and the humanitarian tragedy. A culture of impunity prevails when it comes to crimes against media and journalists. As journalists we are aware that we are exercising self-censorship. Those of us who believe in publishing the truth, talk about that need amongst ourselves. But who amongst us is prepared to take that risk, after Lasantha's killing. His death had silenced many. 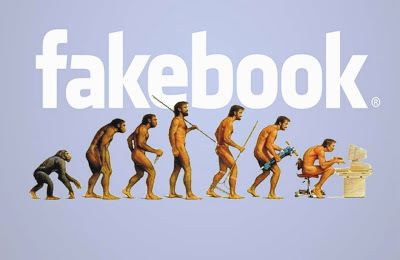 Post Lasantha, the space for alternate news and another point of view is scarce. When people do not have fair access to information that is relevant to their lives, such a society becomes one of blind followers airing and printing the voices of the political masters. This is where Lasantha made his mark. He pushed the limits set by the authorities. He dared to go beyond. He dared to challenge. He was fearless in performing his duty as a journalist. He never gave in to the pressure of self censorship. He dared to dream. Given the current military/ political context of the country, I think Lasantha's central contribution to media in Sri Lanka was his courage and capacity to challenge the censorship within and outside. Official and unofficial. Under Lasantha Wickrametunge, The Sunday Leader imbibed the true spirit of journalism, covering all sides of the war and often giving expression to the civilians' point of view. 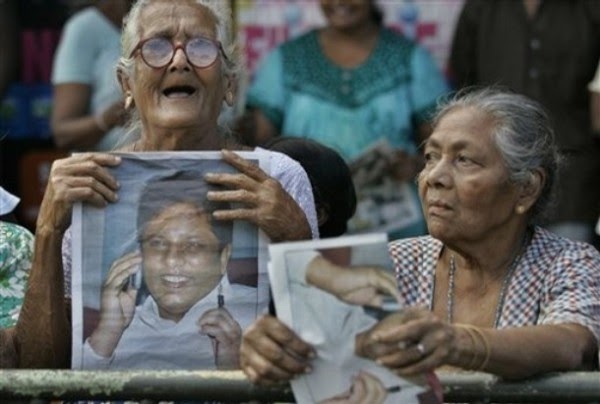 Lasantha reported on war casualties of both sides. He covered the unfolding humanitarian tragedy. He investigated and reported on military procurements. He challenged those in authority continuously and unrelentingly. 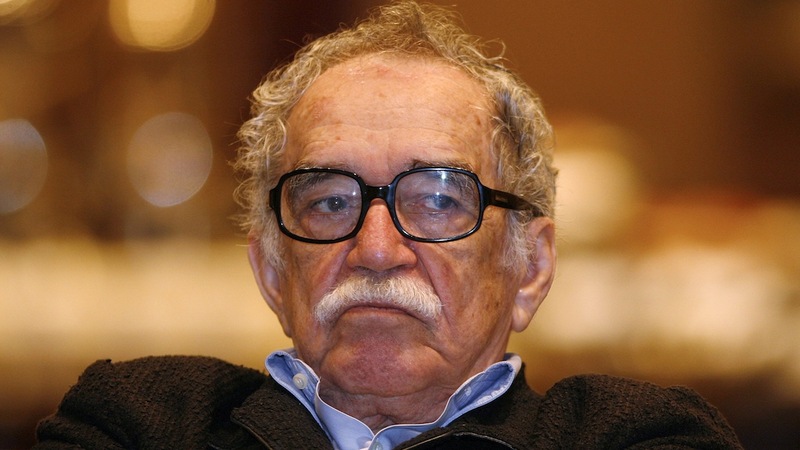 He lived by the codes of the fourth estate and played the role of watch dog through public spirited journalism. No doubt this is why he was killed. Journalism is not a mere vocation but a service. Journalism driven by public service values encourages democracy, pluralism and respect for diversity. In the name of Lasantha Wickrematunge we all need to strive for qualitative journalism, which is- accurate, balanced and fair journalism. 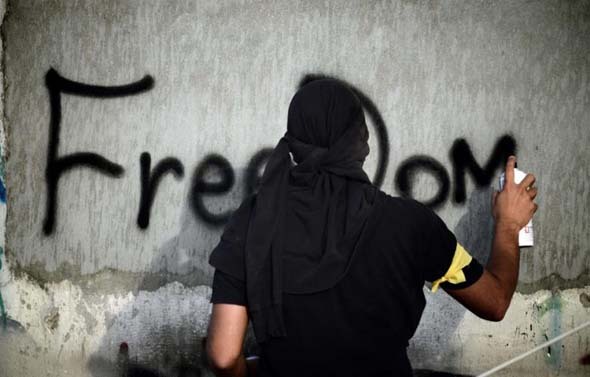 Hopefully, this period of darkness over the media in Sri Lanka will end sooner than later allowing journalists to practice their vocation without the shackles of today. I live in hope and I live for that day. ඒකෝන් නම් සෙනගාල් ජාතික ගායකයාට ශ්‍රී ලංකාවට පැමිණිම ශ්‍රී ලංකාණ්ඩුව විසින් තහනම් කර තිබේ. ඇත්ත වශයෙන්ම නම් මෙම තහනම ශ්‍රී ලංකාවේ අද පවත්නා ප්‍රජාතන්ත්‍රවාදී නොවන පාලනයේ පිළිඹිබුවකි. මෙම තහනම බුදුදහම රැක ගැනීමට ගත් පියවරක් නොව දේශපාලන පියවරකි. මූලධර්මවාදී බලවේගයන්ට හිස නැමීමකි. මූලධර්මවාදය යනු අන්තවාදය සඳහා ආගම දේශපාලනීයකරනය කිරීම යි. ආගමට මුවා වී නිදහස්මතධාරීන් විනාශ කිරීම යි. මෙම තහනමට කලින් ඒකෝන් ප්‍රසංගයට පිටුපස සිටින්නේ යැයි ගෙතූ කතාවක් මත සිරස මාධ්‍ය ජාලයට මූලධර්මවාදී ගල්මුල් ප්‍රහාරයක් ද එල්ල කරන ලදී. මා ඒකෝන් රසිකයකු නොවේ. මට රැප් නමින් හැදින්වෙන ඉංග්‍රිසි සිංදු තේරෙන්නේ ද නැත. මා ඒකොන්ට ශ්‍රී ලංකාව තහනම් කිරීම ගැන ලියන්නේ ඔහුගේ ගීත අගය කරන නිසා හෝ විවාදයට භාජනය වී ඇති ඔහුගේ ගී පසුතල දර්ශන අගය කරන නිසා හෝ නොවේ. මා ලියන්නේ ඒකොන් තහනම නම් සුවිශේෂ සිදුවීම ගැන නොව එමගින් ඇති කරන දේශපාලන සංඥා ගැන ය. අප ජීවත්වන ලෝකය කිසිදු එක් මතවාදයකට, දර්ශනවාදයකට හෝ ආගමකට අයත් එකක් නොවේ. මානව සංවර්ධනයේ අප ජිවත්වන යුගය පුරවැසියාගේ අයිතිය සහ නිදහස මූලික කරගත් ප්‍රජාතන්ත්‍රවාදී යුගය යි. ආගමික විශ්වාසයන් නිසා හෝ ආගමික නොවන විශ්වාසයන් නිසා මිනිසුන් පිටුවාහල් කළ, සිර ගත කළ සහ මරා දැමූ යුගයන් ඇත්තේ අපට පිටු පසිනි. දේශපාලනඥයින් සහ දේශපාලන මතවාද, දර්ශනවාදීන් සහ දර්ශනවාද, මතවාදීන් සහ මතවාද උග්‍ර විවේචනයන්ට භාජනය කිරීමටත් හාස්‍යට ලක් කිරීමටත් තහනමක් අප ප්‍රජාතන්ත්‍රවාදී සමාජයන්හි නැත. එසේ තිබියදී කවර හෝ ආගමක් විවේචනය කිරීම හෝ හාස්‍යට ලක් කිරීම පමණක් තහනම් කළ යුත්තේ ඇයි දැයි මට තේරෙන්නේ නැත. ඒකෝන්ට ශ්‍රී ලංකාව තහනම් කරන ලද්දේ ඔහුගේ සරාගී කෙල්ල නම් ගීතයේ පසුතල දර්ශනයන්හි බුදුරුවක් ඉදිරියේ යට ඇදුම් පමණක් හැඳ නටන කෙල්ලන් නිසා යැයි කියනු ලැබේ. මෙම පසුතල දර්ශන යෝග්‍යයැයි නොසිතන බොහෝ පිරිස් අප සමාජයේ සිටය හැක. එනමුත් එම දර්ශන නිසා ඒකෝන් නම් කලාකරුවාට ශ්‍රී ලංකාව තහනම් කිරීමට මා එකඟ වන්නේ නැත. මෙම දර්ශන නිසා බුදුදහමට වන අගතියක් නැත. ඕනෑම දර්ශනවාදයක ශක්තිය රඳාපවතින්නේ විවේචන සහ විරුද්ධවාදීකම් හමූයේ නැගී සිටීමට ඇති හැකියාව මතය. මෙම පසුතල දර්ශන බුදු දහමට එරෙහිව කරන ලද විරුද්ධවාදී කමක් නොව සෑම දෙයක් ම වෙළද භාණ්ඩ බවට පත් වත්මනෙහි දුර්-විපාකයකි. මෙවැනි හේතුවක් මත ඒකෝන් නම් ජනප්‍රිය කලාකරුවාට ශ්‍රී ලංකාව තහනම් කිරීමෙන් ශ්‍රී ලංකාණ්ඩුව පෙන්වන්නේ බුදුදහමේ නියම ශක්තිය වන ඉවසීම සහ මෛත්‍රිය නොවේ. එමගින් ශ්‍රී ලංකාණ්ඩුව ලෝකයට කියා සිටින්නේ ශ්‍රී ලංකාව ද ලේඛකයින් සහ කලාකරුවන් දඬුකඳේ ගසන මූලධර්මවාදී රටක් බවට පත්ව ඇති බව යි. ශ්‍රී ලංකාව තුළ අද බලපවත්නා මෙම මූලධර්මවාදී බලවේග දෙස බලන විට සිතෙන්නේ ආගම් හි ඉගැන්වෙන බොහෝ දේ බොරු යැයි කියා ප්‍රසිද්ධියේ අභියෝග කළ යුග නිර්මානික ශ්‍රී ලාංකිකයකු වූ ඒබ්‍රහම් ටී කොවූර් අද ජීවත්ව සිටියා නම් මිත්‍යදෘෂ්ඨිකයකු යැයි කියා ඔහුට ගල් ගසා මරා දැමීමට හෝ රටින් පන්නා දමන්නට වුව ඉඩ තිබු බව යි. අප ඉගෙන ගත් බුද්ධචරිතයට අනුව බුද්ධත්වය ලැබීමට පෙරදා රාත්‍රියෙහි මර දූවරුන් පැමිණ ගෞතම සිද්ධාර්ථ ඉදිරියෙහි සරාගී රංගනයක් දැක්වුහ. කවරකු හෝ එම රාත්‍රිය චිත්‍රයට නැගුව හොත් එම කලාකරුවාට ද දැන් ශ්‍රී ලංකාව තහනම් වනු ඇත. වරක් මෙම මර දූවරුන්ගේ රංගනය පිලිඹිබු කැරෙන නේපාලයේ බෙෘද්ධ පිළිරූවක ජායාරුපයක් පළකළ සතිඅන්ත සිංහළ පුවත්පතක් එය බෞද්ධ විරෝධී විජාතික ව්‍යාපාරයක දුෂ්ඨකමක් යැයි ලියුවා ය. මෙම පිළිරුවෙහි අඩනිරුවත් මර දූවරු ගෞතම සිද්ධාර්ථගේ ගෙලෙහි එල්ලී සිටින්නේ රමණයක අවස්ථා සිහිපත් කැරෙන පරිදි ය. අද වුව නේපාලයට යන ඹ්නෑම අයෙකුට මෙම පිළිරුවෙහි අනුරූ රුපියල් දෙතුන් සියයකට මිලදී ගත හැකි ය. වරක් ක්‍රිස්තියානි ලබ්දිකයකු වූ මිතුරකු සමඟ ඇම්ස්ටර්ඩෑම් නුවර දී ඒකාංග නාටකයක් බැලීමට ගියෙමි. ඉඟි නළුවක් වූ එහි යේසුතුමා පිළිබද කොටසක් ද විය. එම කොටස රඟ දැක්වූයේ සහමුලින්ම නිරුවතින් අතිශය උපහාසාත්මක ලෙස ය. එය ඉවසා දරා ගැනීමට දුෂ්කර වූ කිහිප දෙනෙක් මුණු මුණූ ගාමින් නැගිට ගියහ. සිය ගණනාවක් වූ අනෙක් සියල්ලෝ ඉළ කැඩෙනතුරු සිනහවෙමින් එය නැරඹුහ. එය නැරඹිම නිසා මගේ මිතුරාගේ ආගමික භක්තියට හානියක් වූයේ නැත. ඒකෝන් තහනම පිළිබඳ ඇත්ත කතාව තේරුම් ගැනීමට මෙම දේශපාලනීයකරණය වූ පොලීසියේ අවනීතිය අපට අවස්ථාවක් ලබා දෙයි. පොලීසියේ මෙම හැසිරීම අපට පෙන්වන්නේ මෙම ප්‍රහාරය දාමරිකයිනගේ් නොව දේශපාලන බලවතුන්ගේ කාර්යක් බව යි. ගල් ගැසූ පිරිස් කොස් ඇට බෑ බළල්ලු ය. ඒකෝන් තහනම මෙන්ම ඒ පිටින් සිරස මාධ්‍ය ජාලයට කළ ප්‍රහාරය බුදුදහම රැක ගැනීමට කළ දෙයක් නොව දේශපාලන උවමනාවන් වෙනුවෙන් කරන ලද දෙයකි. බුදු දහම අවිහිංසාවාදී දර්ශනයකි. මහ දවාලේ ගල් – මුල් වලින් මාධ්‍ය ආයතනයකට පහර දීම බුදු දහම රැක ගැනීමක් නොව එය අපහාසයට පත් කිරිමකි. ඒකෝන් තහනම හුදෙක් මහා මැතිවරණ අවස්ථාවෙහි ඡන්ද ගරා ගැනීමට කරන ලද උප්පර වැට්ටියකට වඩා වැඩි දෙයකි. එය අපට පෙන්වන්නේ යුද්ධ කාලය තුළ වර්ධනය වූ ශ්‍රී ලංකාවේ දේශපාලන බුද්ධාගමේ බලය යි. සෑම හන්දියක් ගානේ බුදු පිළිම පිහිටුවන ලද්දේ බොහෝ විට ත්‍රී රෝද සමාජ සහ පොලිස් සමාජ හවුලේ ය. ශබ්ද විකාශණ යන්ත්‍ර මගින් උදේ සවස බණ දේශනා ආරම්භ කරන ලදී. රෝහල් පාසැල් යනාදී සෑම පොදු ස්ථානයකම ජනාධිපති, ඇමැති පින්තූර සමඟ බුද්ධ පින්තූර ප්‍රදර්ශණය ආරම්භ විය. බුදුදහම පුද්ගලික පරිමණ්ඩලයේ වූ චින්තනක සිට දේශපාලඥයින් විසින් හැසිරවිය හැකි බලවේගයක් බවට පත් කෙරුණි. මේ සියළු දේ මැද අද ශ්‍රී ලංකාවේ දුර බැහැර පන්සල් වසා දැමෙන තත්වයක් ඇතිවී තිබෙන්නේ අවශ්‍ය තරම් සංඝයා සාසනයෙහි නැති නිසා ය. මෙම දේශපාලන බුද්ධාගම විසින් අපේ සමාජයේ කිසිදු ගුණාත්මක වෙනසක් ඇති නොකළ බව අපි හැම දනිමු. ඒ විසින් ඇති කළ එකම වර්ධනය නම් දේශපාලන උවමනාවන් සඳහා, එනම් සමාජය පාලනය කිරීමේ උපායක් බවට දේශපාලන බුදුදහම පත් වීම යි. යහ පාලනය උදෙසා පැවැත්වීමට නියමිත වූ සංඝ සංගායනාවට බෝම්බ ගැසීමට සිටියේත් ඒකෝන් සංදර්ශනයට බෝම්බ ගසන්නට ඉඩ තිබුනේත් මෙම දේශපාලන බුද්ධාගමේ අනුහසිනි. එහි එකම අරමුණ සමාජය මත ස්වකීය පාලනය නොසෙල්වෙන සේ පිහිටුවීමයි. ඒකෝන් තහනම මා දකින්නේ එම අත්තනෝමතික දේශපාලන ව්‍යාපෘතියේ කොටසක් ලෙස ය. 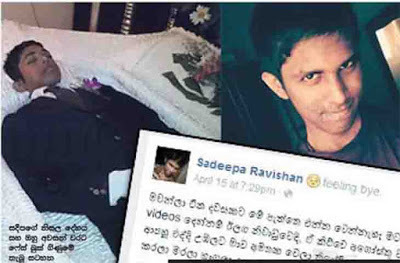 ‛සිරසට’ පහර දුන් මැරයින් මුදා හරියි..
ඊයේ සිරස ප්‍රධාන කාර්යාලයට පහර දීමට බස්රථ දෙකකින් පැමිණි මැරපිරිස සිරස කාර්යාලයට හා එහි සේවකියන්ට බරපතල හානි සිදුකරමින් පහර දී ඇති බව විකල්ප වාර්තා කලේ ය. එම සිද්ධියට අදාල සැකරුවන් 16 දෙනකු පොලීසිය විසින් අත්අඩංගුවට ගෙන ඇති බව පොලිස් ආරංචි මාර්ග සඳහන් කලේය. නමුත් අද පෙරවරුවේ එම සැකකරුවන් 16 දෙනා පොළිස් ඇප මත මුදා හැරිය බව වාර්තා වූ අතර පොළිස් ආරංචිමාර්ග වැඩිදුරටත් සඳහන් කරන්නේ පසුව ඒ පිළිබද අධිකරණයට කරුණු ඉදිරිපත් කරන බව ය. කෙසේ වෙතත් සිරස මාධ්‍ය ආයතනයට පහර දුන් පළමු අවස්ථාව මෙය නොවේ. 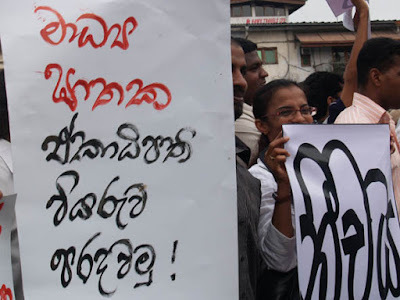 2009 ජනවාරි 6 වනදා සිරස මාධ්‍ය ආයතනයට ඇතුලු වු මැරයින් එයට බෝම්බ ප්‍රහාරයන් ද එල්ල කරමින් විශාල අලාභානි සිදු කලේ ය. කෙසේ නමුත් මේ බාල්දි දැමිල්ල එක්තරා අන්දමක වාල්දි දැමිල්ලක් ලෙස දැක අඳුනාගත් කට්ටියක් පහුගිය දවසක ලසන්තට වැඩක් දුන්හ. කරත්ත රෝදය ගොනා පස්සේ එන්නේ ගොනා කරත්තයට බැඳ තියේනම් පමණකි. අත් කරත්ත වලනම් ගොනා යන්නේ බොහෝවිට රෝදයට පසුපසිනි. ධර්මයේ එන කර්මයට අනුකූලවම මේ වැඩේ සිද්ධ උනාද නැද්ද කියා ‍බොහෝමයක් පොදු ජනතා හිත්වල මේ නිසා යම් යම් කහටවල් තිබේ. ටිකක් ඈත හිඳ බැළුවාම, ලසන්ත යනුත් ‘මහ’ජනතා පුත්‍රයෙක් හෝ උන්ගේම නෑදෑයෙක් මිස, පොදු ජනතාව හෝ සිල්ලර මිනිසුන් අතරම ගැවසුණු කෙනෙක් කියා හිතන්නට සාධක අඩුයැයි හිතේ. එහෙම හිතුවාම මේකත් එක්තරා විදිහක මණ්ඩලේ කචල් එකක් කියා නොහිතන අයත් නැත්තේම නැති වග දහ අතේ මොරදෙන ලවුස් ස්පීකර් වලට කන් දෙන‍ විට හැ‍‍‍ඟෙයි. රබර් බට වාගේ නැවෙන ලපටි උඩ අතුවල සෙල්ලං කරන්නේ රිලව් මිස ඔරං ඔටන් ලා නොවෙන බව කාටවත් ඉලේට ඇඟිල්ලෙන් ඇන කියා දෙන්නට ඕනෑ කමක් නැත. මෙවන් පිරිස් බොහොමයක් ලසන්තගේ මලගමේ දීත් සෙල්ලම් පෙන්නූ හැටි පෙණුනි. සමහර බෑන් චූන් කාරයින් නම් මේ මල ගෙදරත් පිම්බේ මඟුල් අවමඟුල් නොබලා ඒ අය කවදත් පිඹින පපර නලා හා පපර චූන් ම පමණකි. නොදන්නා දේ කරන්න යනවාට වඩා තමුන්ට පුළුවන් දේ කර කර බාගෙන ඉන්නා එකත් අගේ නොකල යුතුම දෙයක් නොවේ. එසේ වුණත් සියළු කාරණා එකතු කර සලකා බලන විට මේ කිසි දෙයක්, අත්තඩියේ මහ පාරක් මැද මහ දවාලේ සිදුවූ ලසන්තගේ ඝාතනයත් ඇතුළු‍ව, අපේ රටේ සිදුවෙන්නට බැරි අමුතු දේවල් ය කියාත් හිතෙන්නේ නැත. මේ සිද්ධිය, පුංචි පන්තිවල හිට වාද විවාද මාතෘකාවක් වන “පෑනද කඩුවද” කතාවේම කොටහක් ලෙසත් අපට පෙන්වන නාටක කාරයෝත් සිටිති. කඩු ගත්තෝත්, පෑන් ගත්තෝත්, කඩු‍ව ‍ ‍එක අතකිනුත් පෑන අනෙක් අතිනුත් ගත්තෝත් ආදි නානා විධ නළු නිළියෝ මේ විවාදයෙන් දිනුවේ කවුද කියාත් විවාද කරති. මිනිහෙක් මරා දැමීම, අමු අමුවේ, මහ දවාලේ, වෙඩි තියා පමණක් නොව, කෑලි කෑලි කර, කපා කොටා මරා දැමීම, හිස ගසා පැල ඉනි වැටේ රඳවා මරා දැමීම, ලයිට් කණුවේ එල්ලා වෙඩි තියා මරා දැමීම, අත පය බැඳ නොමරා මරා ග‍ඟේ පාකර යැවීම මෙන්ම, ටයර් සෑයක ආදාහනය කොට මරා දැමීම ආදි මෙකී නොකී අනේක විධ මරා දැමිලි අපේ රටේ මෑත ඉතිහාසය තුල ඇති පදම් ඇත. ‍මිනිහෙක් කීවාට, මෙහෙම මැරුණ උන්ට ස්ත්‍රී පුරුෂ ලමා ලපටි බාල මහළු ආදී කිසිම බේදයක් බලපෑවේ නැත. රොබට් නොක්ස් ගේ ‘අයිලන්ඩ් සිලෝන්’ හි විස්තර වෙන රාජ දඬුවම් වල කෘරත්වය ගැනත්, ඇහැලේපොල පවුලට ලැබුණු වද හිංසා ගැනත් කියවා ඇඟ කිලිපොලවා ගත් යුගයකින් පසු ඒ අත්දැකීම් ඇස් පනා පිට විඳින්නට අපේ රටේ පරම්පරා දෙක තුනකටම වාසනාව ලැබී ති‍බේ. කවුරු කොහොම හිතන්නට උත්සාහ කලත්, කවුරු කොහොම අඟවන්නට උත්සාහ කලත් හිතා බැළුවාම හිතෙන්නේ “මෙවන් තැනක් නම් නැත්තේය වෙන කොහේවත් ” කියලාමය. “සෑම පුවත් පතකටම ස්වකීය වූ අරමුණක් ඇත. අපටත් එසේම බව අපි නොසඟවා කියමු. අපේ කැපවීම අපේ රට විවෘත, ඓහික, මධ්‍යස්ථ හා ප්‍රජාතන්ත්‍රවාදී මගකට එළඹෙනු දැකීමයි. මේ වදන් එක එක ගැන සිතන්න. ඒ එක එකක් තුල පෘතුල අර්ථයන් ගැබ්ව තිබේ. කුමන හෝ පද්ධතියක් යම් අවස්ථාවක හෝ තලයක සිට තවත් තලයකට සංක්‍රමණය වීම අප්‍රමාණවූ මංපෙත් ඔස්සේ සිදුවිය හැකිය. අවසානයේ වැදගත් වන්නේ අවසාන ඵලය මිස මාර්ගය නොවේ. එනමුදු, ‍ඒ වෙනස සඳහා වැයවන්නාවු කාලයත් පිරිවැයත් දෙකම, මාර්ගය මත රඳා පවත්නේය.